It is a fact that warm air can hold more water as vapour than cool air. Condensation is caused when moisture-laden air comes into contact with a cold surface - the air is cooled to the point where it can no longer hold its burden of water vapour. At this point, (DEWPOINT), water begins to drop out of the air, and is seen as condensation on surfaces. On impervious surfaces such as glass and gloss paint, beads or a film of water collect. On permeable surfaces such as wallpaper and porous plaster, the condensing water is absorbed into the material. Therefore, the problem is not always initially obvious. For many years people have know of the health problems associated with damp conditions. Many recent studies have been done to prove the link between damp, moldy conditions and health problems in both adults and also those most at risk children. Below is an exert from one such study and we have included some links to a few others. State of the Science on Molds and Human Health Statement of Stephen C. Redd, M.D. More than 1,000 different kinds of indoor molds have been found in U.S. homes. Molds spread and reproduce by making spores, which are very small and lightweight, able to travel through air, capable of resisting dry, adverse environmental conditions, and hence capable of surviving a long time. Molds need moisture and food to grow, and their growth is stimulated by warm, damp, and humid conditions. Respiratory infections due to inhalation of the fungus Aspergillus have been documented mostly in immunocompromised individuals. Molds also have been associated with some cancers. Two mold-produced toxins (aflatoxins and ochratoxin A) have been classified by the National Toxicology Program as human carcinogens. In its 1993 report “Indoor Allergens,” the Institute of Medicine (IOM) concluded that airborne fungal allergens were most often associated with allergic diseases, such as allergic rhinitis/conjunctivitis, allergic asthma, and hypersensitivity pneumonitis. In its 2000 report “Clearing the Air: Asthma and Indoor Air Exposures,” IOM concluded that there is sufficient evidence of an association between exposure to mold and exacerbations of asthma. For people who are allergic to mold, common effects include hay-fever-like allergic symptoms. Certain individuals with chronic respiratory disease (chronic obstructive pulmonary disease or asthma) may experience difficulty breathing when exposed to mold. Also, people with immune suppression or underlying lung disease are more susceptible to fungal infections. To discourage termites and improve inspection access. Fix leaking water pipes and drains. Reduce the amount of timber used in construction - especially in inaccessible areas. Improve sub-floor ventilation, drainage and access. Ensure concrete slab is properly designed, compacted, cured and easily inspected. Do not leave timber formwork behind, especially under a suspended floor construction. Have a program of regular inspections arranged with a pest controller (early spring to late summer is best - termites are most active at this time). Avoid storing potential termite food (eg. timber stacks, old stumps, building refuse) near buildings Use termite resistant timber (naturally resistant or treated - ask a timber supplier). Remove termite colonies from building vicinity. Anti-Damp can recommend specialist in pest control and can help with the ventilation improvements needed to reduce reoccurrence. Subterranean Termites This group of termites have colonies & are found either underground or in the base of trees, with tunnels (galleries) radiating from the nest through the soil to food sources. Workings between the soil and above-ground food sources are concealed in mud-like shelter tubes or galleries. Dampwood Termites These are only found in timber that is affected by moisture and is subject to fungal decay. This timber may be rotting branches in trees or stumps of houses that are moisture affected. Drywood Termites only exist in tropical or sub-tropical regions of Australia. These termites do not require contact with the ground and moisture is obtained directly from the timber. These termites do not cause as much damage as subterranean termites and colonies are much smaller in number. Harvester (Grass) Termites These termites eat grasses and are most common in tropical regions. They are no threat to buildings. Termites can be eradicated If termite damage is found in the home, don't panic and DO NOT DISTURB ANYTHING. Doing so prompts the termites to move elsewhere making full detection and eradication more difficult. It may also result in the damage being increased elsewhere. An expert should perform the eradication treatment, so make sure you contact only currently licensed members of your State's pest control association. These people will also set up a chemical barrier around the walls, foundations and footings, to discourage the termites from returning. If you would like to find out more, ring Barry on 0419 842 686. Barry also offers home inspections for a fee. 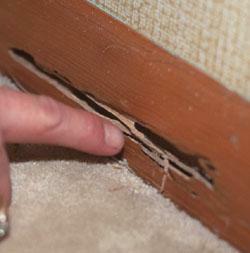 If you are worried about termites, rising damp, condensation or moisture damage then a home inspection can help.